Have you all heard of Minted? It's a great online shop for invitations and personal stationery (and no one paid me to say that...they just always have my favorite designs). Their design community is wonderful, and they have lots of design contests throughout the year for anyone to enter! So I thought I would try my hand at the Minted design challenge this week—on a whim. 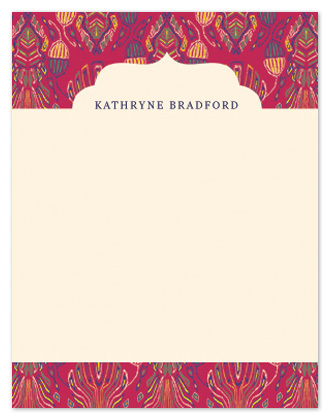 The category is women's personal stationery flat-cards. I wanted to do something ikat-inspired with a tapestry feel. Something elegant. Here is my final design (boasting Sarah's daughter's name). If you like it, you can vote for my design, HERE. If you are designer yourself, stop by and check out the upcoming challenges (or just rate some of the designs up for votes in their current challenges). It's a great place for inspiration, or a way to get your designs out there. Plus who knows—you just might win!